A stroll through the narrow streets of the Latin Quarter in medieval Paris. The Latin Quarter on the Left Bank is my favorite neighborhood in Paris. Perhaps because I was a French teacher, perhaps because I led student tours for many years, this colorful part of Paris traditionally frequented by students, intellectuals, writers, artists and the young in general has always been close to my heart. The members of my tours were always surprised to learn that it got its name “Latin Quarter” because in the Middle Ages Latin was the language of learning, and the University of Paris had its beginnings in the 12th century right in this part of town. The first night in Paris on my tours I wanted the group to experience the narrow medieval streets of this historic district. I suggest starting out at the métro Maubert-Mutualité, crossing Bd. St-Germain and taking Rue Maître Albert, leading into Rue de la Bûcherie, across the river from Notre Dame. Just delight in the tiny streets that haven't changed all that much for 800 years! There are several charming places to have dinner along these streets and also along la Rue Galande, a little to the left, across Rue Lagrange. From the front of the church go to the Rue St-Jacques and onto the Rue du Petit Pont and just before you reach the river, turn left onto Rue de la Huchette. This little street and all the other ancient streets around it lying between Bd. St-Michel, Bd. St-Germain and Rue St-Jacques are very interesting and exciting places to stroll, especially after dark. This is not elegant Paris! But it is old Paris—passageways unchanged for centuries including rue de la Harpe, rue Xavier Privas, and the very very narrow rue du Chat qui Pêche. These streets are crowded, noisy, youthful and colorful: lots of cheap restaurants, many of them Greek, with the waiters standing outside trying to lure you in. On Rue de la Huchette, be sure to take a look at the tiny Théâtre de la Huchette, with continuous performances of Ionesco's plays for over 48 years. Just wander around these narrow streets, and maybe pick up a baclava in one of the many shops specializing in Mediterranean pastries. One treasure you want to see is the church of St-Séverin. Rue de la Harpe crosses Rue St-Séverin but everything in this neighborhood is so close you won't miss it. If you are here at night you will enjoy the lighting of this Gothic gem, and if during the day, you may want to visit the interior. Interesting to note that this church is a stone's throw from the mighty Notre Dame and I have always wondered how the relatively small population of 12th and 13th century Paris could sustain so many churches. In future blogs we will look at more of my favorite spots in the 5th and 6th arrondissements. Stay tuned! Way back in 1973 I was the director of the French student teacher program at UC Santa Barbara and visited the local high schools to evaluate and guide the young interns. Along the way the students in their classes got to know me and asked if I would take them to France. And so began a delightful career that lasted until 2005. I always tried to give my participants the most authentic “France Experience” (the original name of my tours) possible-- from the teenagers who were my first and longest fellow-travelers, to the adult wine tours I led in the late 1990's. I thought it would be fun to share these travels on this blog site, and for the first in this series, will begin with my favorite tour day in Paris. This is the day we visit Ile de la Cité, literally from one tip of the island to the other. 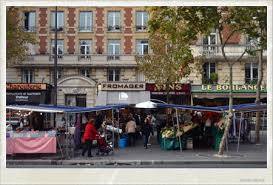 At around 9:30 in the morning, we go to the open air market at the Maubert-Mutualité métro stop at Place Maubert, ( 5e arrondissement) to buy provisions for a picnic we will have later. Don't forget your shopping bag or filet, and be sure to have some utensils with you, like a knife for spreading and cutting, a corkscrew and a small cup for drinking if you have wine. This market is open every Tuesday, Thursday and Saturday of the year and is a real cultural experience. There is even a little section for “bio”, organic produce. And if you don't find what you want at the market, there are several permanent stores at the same location for bread (la boulangerie), cheese (la fromagerie) and wine (of course). After gathering all the delicious breads, cheeses, and charcuterie, we will cross Bd. St-Germain and walk down the little street rue de Bièvre, just opposite the market. A little anecdote: for years this street was closed to automobile traffic and two policemen were always on duty as French President Mitterand lived in an apartment on this street. The street is named after a creek (la Bièvre) still active underground and running to the Seine. You arrive at the Seine and cross the river on Pont de l'Archevêché. This brings you to one of the best photo ops of Notre Dame Cathedral so don't hesitate to spend a little time here with perhaps boats gliding past below or moored along the banks. The next stop on this tour will be looked at in the next blog as we actually start our day on Ile de la Cité. This spot is practically unknown and more rarely visited but it will touch you in many ways. Don't miss the next installment! My love for France doesn't stop with its physical attractions. I am also passionate about the sound of the language. I came out of retirement to share with the world my particular take on how to correct our English language accents so we sound more authentically French. I think I have something to offer to the non-native French speakers of the world and a gift to give to the propogation of the purity and the beauty of this language we all love. Please look at my website (pronouncingfrench.com) for more information on myself and the course being released on January 31, 2016, Mastering French Pronunciation. Dedicated to French teachers, students, expats living in France, those doing business with France, and all who would like to sound more authentic when speaking the beautiful French language! Merci!.